"Personalized Stamped Tag Charm Necklace for Two Grandchildren, Silver"
This personalized grandmother's necklace is a wonderful gift for the grandmonther of two. The necklace comes with two charms to represent the grandchildren who stole your heart. The personalized grandmother's stamp tag necklace is a unique and beautiful design which will keep those you love close to your heart. 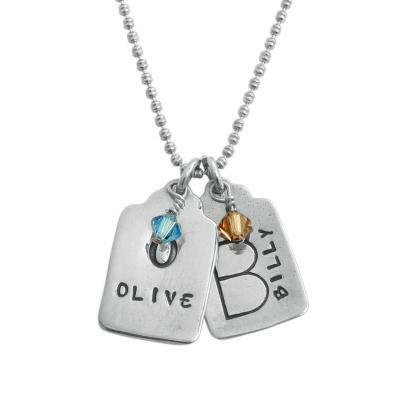 This unique grandmother's necklace comes with two personalized charms to represent both grandkids for a grandmother of two. Available in two stamping styles - vertical and horizontal - we stamp the first letter of the name large and then the full name to the side or along the bottom. The sterling silver charms hang from our sterling silver ocho chain. A birthstone is added enhance each charm. Design a stamp tag for each kid or grandkid or for every member of the family. You can pick one style for the girls and the other style for the boys. This listing is for a 16" chain, two stamped charms and two birthstone crystals. You can select an 18" chain in the dropdown if you prefer a longer necklace. If you would like to order the Stamp Tag Charm without the chain please visit the Stamp Tag Charm Only page. For the vertical option, the large block letter is centered on the left side with a maximum of 7 characters stamped up the right side. For the horizontal option, a block letter will be centered on the top section and the name will be stamped along the bottom with a maximum of 5 characters. Since this item is personalized, all sales are final. All silver is sterling and the Stamp Tag is approx. 3/4" by 1/2". The crystal is 4mm. We only use sterling silver, 14K gold, golded filled, gold vermeil and bronze in our products.